Paris-Roubaix fell on this date in 1906, 1922, 1933, 1972 and 1978. 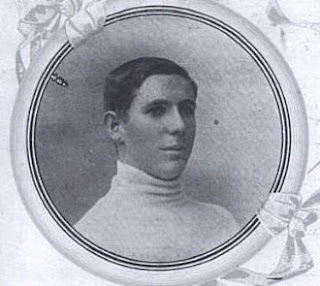 The 1906 winner was Henri Cornet, whose real name was Henri Jardry; nobody knows why he chose to race under a false name. 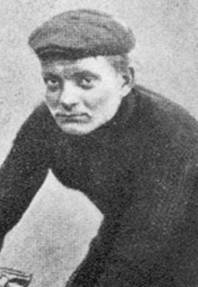 Cornet had won the Tour de France two years previously after Maurice Garin (who had won the first Tour one year earlier and won this race in 1897 and 1898), Lucien Pothier, César Garin (Maurice's brother) and Hippolyte Aucouturier (who had won Paris-Roubaix in 1903 and 1904) were disqualified from the top four places for cheating and, as he was 19 at the time, he remains the youngest ever Tour winner. This victory, meanwhile, was won without luck - he beat Marcel Cadolle (whose career was cut short when he seriously injured his knee in the Tour one year later), René Pottier, Louis Trousselier, César Garin and Aucouturier fair and square in a final sprint. Photographs of Cornet show a rather glum, depressed-looking young man; but he was remembered by those who knew him as charming, quick to smile and in possession of a good sense of humour - including by Henri Desgrange, who nicknamed him Le Rigolo - "The Joker." In 1922, the finish was moved to the Avénue des Villas, which has since been renamed the Avénue Gustave Delory, and where it would remain until 1928. The winner that year was Albert Dejonghe who would win Stage 4 at the Tour de France the following year, then finish in 5th place at the 1925 Tour and 6th in 1926. The 1933 edition was won by Sylvère Maes, who would also win the Tour de France in 1936 and 1939. Roger de Vlaeminck won in 1972, the first victory on the way to becoming the first - and to date, the only - man to have won Paris-Roubaix four times, his fourth victory coming in 1977 (in 2012, his record was finally equalled by Tom Boonen). Two minutes and thirteen seconds behind him was Wakefield-born Barry Hoban, who took 3rd place and (at the time of writing) the best ever result by a British rider. 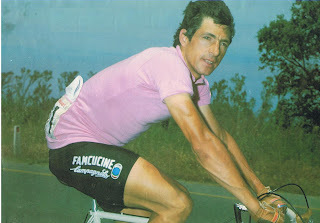 The 1978 race was won by Francesco Moser, the first step along his path to becoming the second man to win in three consecutive years (the first man to do so was Octave Lapize in 1911. Three new cobbled sections were used for the first time in 1978; the 3.1km Mons-en-Pévèle which has become known as one of the most dangerous parts of the race; the 1.4km Pont Thibaut to Ennevelin and the 1.1km Le Carrefour de l'Arbre to Gruson (Gruson, incidentally, was also the name of the little black dog that knocked Bernard Hinault off his bike, 13km from the finish of the 1982 Paris-Roubaix). La Flèche Wallonne fell on this day in 1986 and 1997. 1986, the 50th edition of the race, ran for 248km from Spa to Huy - only one edition since has been longer. The winner was the legendary Laurent Fignon, one of his few victories during a two-year period in which he suffered a series of injuries. The 1997 race was the 61st edition, taking a 200.5km course which for a twelfth and final year ran from Spa to Huy. Laurent Jalabert won for a second time, his first win having been two years previously, which makes him the last Frenchman to have won this race. Suzanne de Geode, born in Zoeterwoude, Netherlands on this day in 1984, came 2nd in the National Newcomers Road Race Championship of 2000, then won both the National and World Junior Road Race a year later before winning the Elite National title in 2003, then 3rd in 2006 and 2007 - and won the National Time Trial Championship, also at Elite level, in 2005. She won the Damesronde van Drenthe in 2005 and has achieved podium stage finishes in numerous prestigious events including the Holland Ladies' Tour (1st, Stage 3 2003; 2nd, Stage 6 2005; the Giro della Toscana (1st, Stage 1b 2005); the Omloop het Volk/Omloop Het Nieuwsblad (1st, 2006; 1st, 2009); the Tour de l'Aude (3rd, Stage 5 2006; 3rd, Stage 2, 2008); the GP Gerrie Knetemann (2nd, 2006); the Emakumeen Bira (2nd, Stage 2 2007) and the Tour of New Zealand (1st, Stage 1 2008). 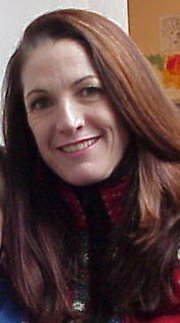 Jeanne Golay, who was born in Florida on this day in 1962, won the US National Road Race Championship in 1992, 1995 and 1995. In 1988, she was ranked the best female US cyclist and won the first of two National Individual Time Trial titles a year later, with the second coming in 1992 and would also ride with the winning National Team Time Trial teams in 1990, 1991, 1992, also riding with the World Champion team in 1992; after which she received the US Cycling Federation Athlete of the Year award. Golay returned to the top of the US rankings in 1994 when she won the Redlands Bicycle Classic, Dole Cycling Classic, Electricity City Challenge, Tour of Somervilleand Korbel Champagne Cup Series (and a bronze medal at the World Championships), and remained there in 1995 with victories at the PanAmerican Games, Sequoia Cycling Classic, National Road Championships, Frigidaire Cycling Classic, Colorado Cycling Classic and Fresca Cup. She retired in 1996 after winning the Valley of the Sun and the US National Criterium Championships. The long distance Jeanne Golay Trail, once known as the Red Mountain Trail, was re-named in her honour. Phil O'Shea was born in New Zealand on this day in 1889 - his twin brother died at birth. As a child, O'Shea was prone to frequent bouts of quinsy, a disease now better known as peritonsillar abscess, which would cause his throat to swell and become so painful that he couldn't eat and had difficulty breathing. This seems to have stunted his growth - at 17 and although his father was a large man more than 183cm in height, he stood just 167cm tall and weighed less than 54kg. However, he took up cycling when he was 19 and found it suited him very well - two years later, he had increased his muscle mass so much that he weighed in at almost 71kg and he went on to dominate the cycling scene in New Zealand and Autralia between 1911 and 1923. In the early days, be made up for brawn with sheer determination and a canny ability to read his opponents: when he started the Timaru to Christchurch race in 1909, he was given a 45 minute head start over the rest of the field and yet nobody expected him to finish. What they didn't know was that the young rider had spent much of the time when his childhood illness confined him to bed poring over the sports newspapers and had created an indexed record of races, which over time instilled him with an expert understanding of race tactics that would be the envy of any modern directeur sportif. He didn't just finish the race - he won, despite having to ride with a buckled rear wheel after another entrant rode into his bike while he was stopped at a drinks station enjoying a glass of milk. Two years later, the race became Christchurch to Timaru because the organisers felt that the people of Timaru had been such good hosts of the start in years gone by that they deserved the opportunity to see the finish. 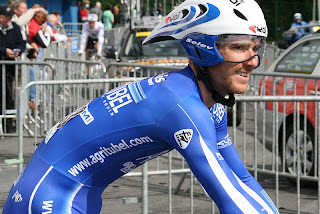 O'Shea was there once again, but during the race a dog ran into the road and got between his wheels, sending him flying. He landed heavily on his head and was covered in cuts and bruises. Yet he got back on his bike and won the race - bleeding all the way. O'Shea remained a household name for a long time after his career came to an end and by the end of the 1960s there was talk of him becoming recognised as New Zealand's greatest ever athlete. Even today, a century after his peak, he remains well-known in his home country. Marc Madiot, born in Renazé on this day in 1959, is best known as the winner of Paris-Roubaix in 1985 and 1991 but his palmares contains many other victories beginning with the 1977 National Championships and the 1979 Under-23 Paris-Roubaix. In 1980, he won the National Championships in the Elite class, then a year later he won the Tour du Limousin and in 1982 the National Cyclo Cross Championships. 1984 brought him the Trophée des Grimpeurs and Stages 2 and 3 at the Tour de France and in 1987 he won another National Road Race Championship, the Tour de l'Avenir and 3rd place at the Giro di Lombardia. He took a second Trophée des Grimpeurs in 1992 and wins in numerous races before retirement the following year. Heiko Salzwedel was born in Schmalkalden, East Germany, on this day in 1957 who, having emigrated to Australia in 1990, set up the Australian Institute of Sport' road cycling and mountain bike programmes. Matt White, Kathy Watt, Henk Vogel and Cadel Evans are just a few of the world-class cyclists to have been produced by by the programme. In 2001, he became Performance manager at the British Cycling Federation, then moved on to become a consultant to the Danish Federation in 2003 where he worked with organisations including SRM and what was then known as T-Mobile, later to become HTC-Highroad. As head of the T-Mobile Development Program, he was instrumental in shaping the early careers of Stefan Denifl, Geraint Thomas and Mark Cavendish. In 2008, Salwedel returned to British Cycling where he was once again employed as Performance Manager. Romain Feillu, born in Châteaudun on this day in 1984, signed up to Aritubel as a stagiaire in 2005 and then impressed his team mates, managers and the cycling world by winning the Tour de la Somme and GP Tours in his first full year, then the Circuit de l'Aulne, Paris–Bourges, Stage 3 at the Tour de Luxembourg and the overall General Classification at the Tour of Britain in his second. In 2008, he won the Youth category for Stage 4 at the Tour de France, leaving no doubt that he was destined to be one of the shining lights of the coming generation - which he confirmed by winning the Points competitions at the Tour de Picardie in 2009 and the Tour de Burgos in 2010, followed by the General Classification at the Tour de Picardiethree stages at the Tour Méditerranéen, one at the Tour of Luxembourg and 2nd place for Stage 3 at the Tour de France in 2011. 2012 and 2013 brought some good results - second at the GP Pino Cerami, fourth at Scheldeprijs, sixth at Cholet-Pays de Loire in 2012, second again at the Pino Cerami, ninth at Scheldeprijs by his birthday in 2013 - but no victories. 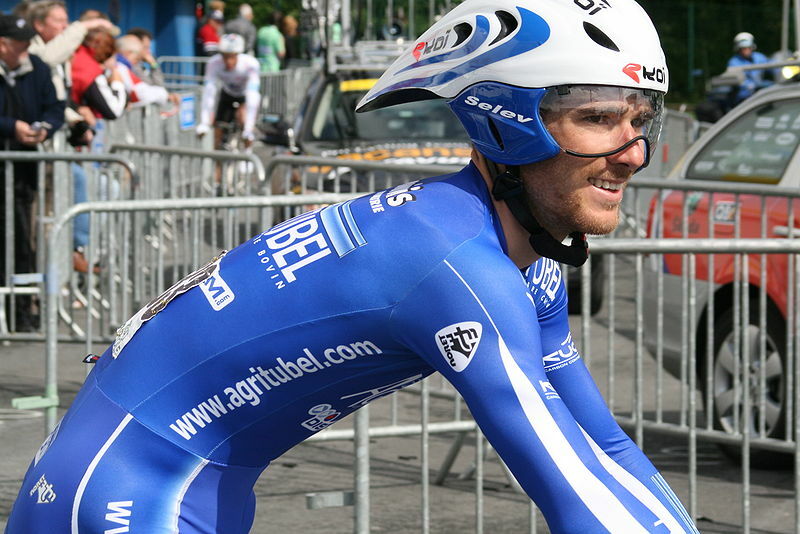 He is the older brother of Brice Feillu, also a professional cyclist. Other cyclists born on this day: Kathrin Freitag (Germany, 1974); Alan Geldard (Great Britain, 1927); Valery Khitrov (USSR, 1941); Ndjibu N'Golomingi (Congo, 1964); Hermann Martens (Germany, 1877, died 1916); Maurice Coomarawel (Sri Lanka, 1940, died 2008); Jānis Līvens (Russia, 1884); Paula Westher (Sweden, 1965); Raj Kumar Mehra (India, 1918, died 2001); Nils Johansson (Sweden, 1920, died 1999); René Deceja (Uruguay, 1934, died 2007); Davoud Akhlagi (Iran, 1944); Alipi Kostadinov (Czechoslovakia, 1955); David Gillow (Zimbabwe, 1958); Magne Orre (Norway, 1950). We could really do with some extra cash for, erm, vital medici... oh sod it. We like beer. Fancy buying us a pint? Please help us keep Cyclopunk advert-free! We could really do with some extra cash. If you fancy buying us a coffee, here's how to do so. Cyclopunk is licensed under a Creative Commons Attribution-NonCommercial-ShareAlike 3.0 Unported License. Based on a work at cyclopunk.blogspot.com.